On Philadelphia’s Dilworth Plaza (the west side of City Hall) they’ve been staging a Christmas Market in the European tradition. I’ve been to several in Germany and I visited this one with some skepticism. It was decent…not Nuremberg, but decent. The stalls were reminiscent of those in the European markets; the merchandise wasn’t always. A South Phila brat is not quite the same as a Nuremburg Wurst, and the Gluhwine wasn’t. But, something new and enjoyable. 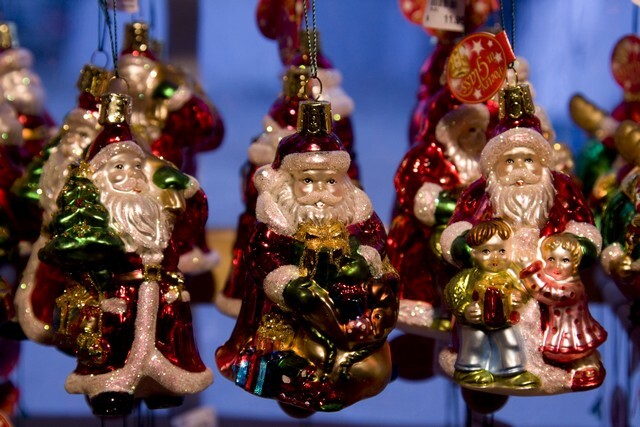 The Kathe Wohlfahrt chain from Germany was there, the premier supplier of traditional German-made Christmas merchandise. 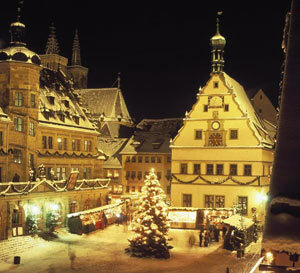 I’ve visited their “Mother” store in Rothenburg in Bavaria, just off to the left of the town square shown here (image from their website). They also exhibit in the annual Bethlehem, PA Christkindlmarkt. Here’s some of their Christmas Ornament collection. 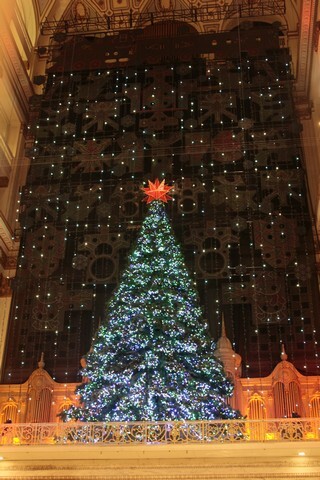 Of course one could not go into Philadelphia at Christmas time without visiting the light show at Macy’s. 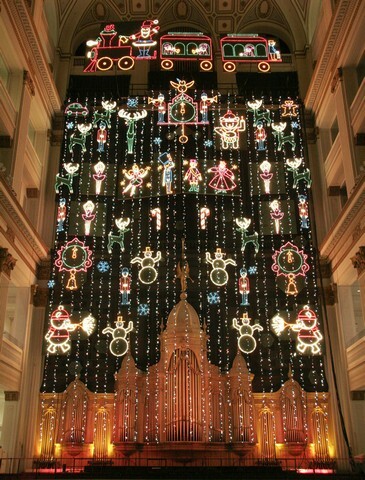 It was started about 1956 when the store was Wanamaker’s, and that version included dancing illuminated fountains until about 2000. An early video of the show which includes the dancing fountains can be seen here. The show has been completely rebuilt and its almost 100,000 LEDs, the music, and the narration (Julie Andrews) are all computer controlled. Year in and year out it never fails to be an impressive heart-warming show. Here’s aother view taken in 2006. This shows all of the background figures illuminated as part of the finale. Notice, however, that there’s no tree as seen in the above picture. The tree was restored in (I think) 2008. Another great Philadelphia tradition is the annual Saint Lucia Fest held at Old Swede’s Church (Gloria Dei). 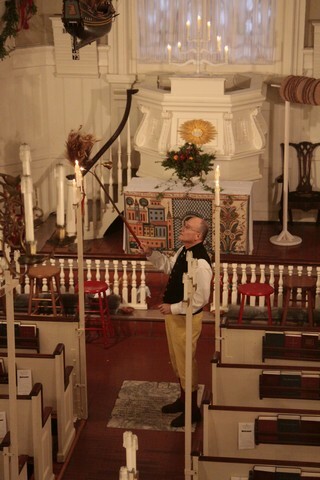 The church was established by Swedish colonists in 1667 and the building dates from 1700. They have been celebrating Santa Lucia since 1938, and participation is hotly sought after. It is partly a pagan celebration of the Winter Solstice when, at the year’s darkest, the light will begin to return. It is also in honor of the 3rd century Sicilian martyr, Lucia. The presentation, a pageant acted by church members. is about Swedish family home life in the depths of winter. The highlight, however, is about the tradition of the household’s young girls rising early to prepare and bring coffee and cakes to the other family members. The presentation is of these young girls proceeding showly down the church aisles, wearing white nightgowns, carrying candles and singing Santa Lucia in Swedish. The girl who plays Lucia arrives last with a crown of lighted candles in her hair. For the conclusion all of the girls face the audience and, still carrying their candles, sing Silent Night in Swedish. Below we see the altar, and the aisle candles being lit. On the right is part of the procession, a photograph from their web site. Various generations of my family with our Swedish heritage have attended over the years. As my good, fully Swedish friend, Nils, would want me to point out, the ceremony is also presented annually at the Swedish-American Museum in south Philadelphia. Wherever presented, it is an informative, entertaining…and, for my family, deeply moving ceremony.